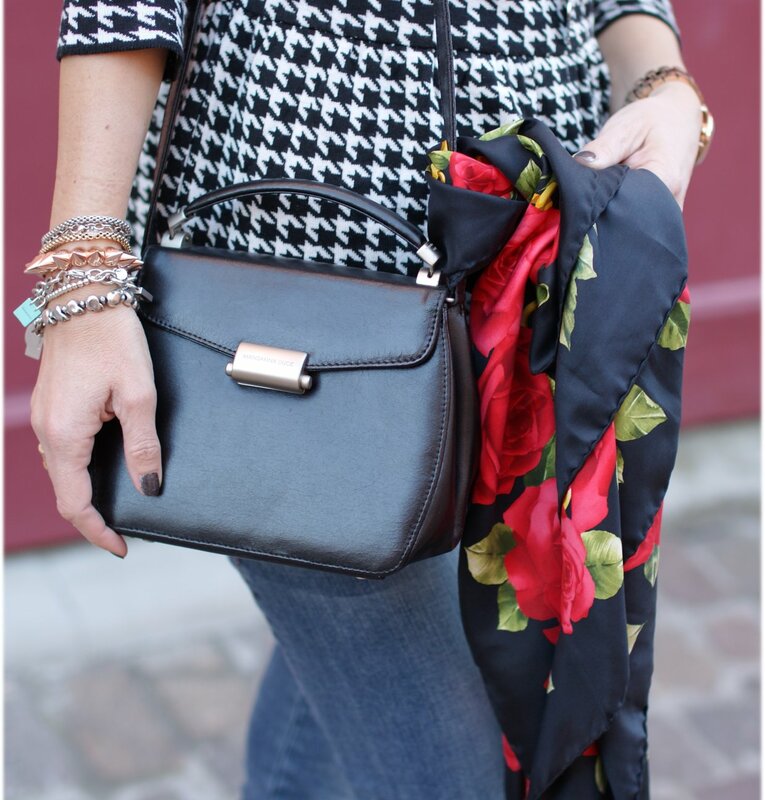 Why have I named this post "Parisian style" ? I don't know exactly, but probably it's because today, from my office room, for a minute I was totally daydreaming about a vacation in Paris and I think this simple outfit would be totally nice for a walk on the Rive Gauche, as a relaxed tourist !. You had already seen this black and white peplum sweater in my post dedicated pied de poule trend, well, I decided to go for a simple and casual look when I finally got to wear it for the first time, matching jeans and a new pair of total black Lemaré wedge sneakers, same shape of the other ones I have. Perché mai chiamare questo post "Parisian style" ? Non lo so esattamente, forse è perché oggi, dalla mia stanza in ufficio, per un attimo ho sognato ad occhi aperti di partire per una breve vacanza a Parigi e credo che questo semplice outfit sarebbe carino per una passeggiata sulla Rive Gauche, da turista in tutto relax !. Avevate già visto una preview di questa maglia bianca e nera, con peplum, nel mio post dedicato al trend del pied de poule, e ho deciso di indossarla per la prima volta con un look casual e semplice, abbinandovi i jeans e un nuovo paio di sneakers con zeppa interna Lemaré, stavolta total black !. The black leather shoulder bag is not new, actually I bought it many years ago from Mandarina Duck...I even forgot to have it, then when I found it again inside a box with other handbags I was so happy, because I think it's truly lovely and timeless !. You can see the details of the bag in the pic below. La borsa a tracolla in pelle nera non è una new entry, al contrario, risale a diversi anni fa, l'avevo comprata dalla Mandarina Duck...mi ero persino dimenticata di averla e quando l'ho ritrovata in fondo ad uno scatolone dove giaceva in mezzo ad altre borse ne sono stata molto felice, perché la trovo adorabile e senza tempo !. Potete vederla meglio nella foto sottostante. These shoes gave me addiction ! They are very comfy and for a person used to walk on high heels they give that bit of height that I miss when I am walking in sneakers and I have to say I am happy I also got them in total black because it's so easy to match them with most of my clothes. See them better below !. Queste scarpe danno assuefazione ! Sono troppo comode e per una persona abituata a camminare sui tacchi alti danno quel po' di altezza che mi manca quando cammino con un paio di sneakers. Sono contenta di averle prese anche in total black perché in questo modo posso facilmente abbinarle. 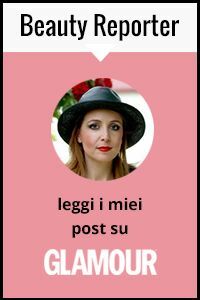 Guardatele in dettaglio nella foto sottostante !. In these pics I am wearing a silver chain with extra large heart tag charm from Tiffany, a classic I never stop loving !. Bracelets are from Tiffany, Fope and the studded one is from Asos. The watch is Michael Kors and even tho I have a few watches, I keep wearing this one, I love it too much !. Nail polish is from OPI...a friend told me I should stop it with all those dark nail polishes...maybe he's right but I have to confess I ended up buying a black Dior nail polish this afternoon (it's called DIVA)...if buying dark nail polishes is a crime, I plead guilty, just as guilty as I am of dreaming of a life in Paris or in New York !. Nelle foto indosso una collana in argento con cuore extra large di Tiffany, un classico che non smette mai di piacermi !. I bracciali sono di Tiffany, di Fope e quello borchiato è di Asos. L'orologio è Michael Kors e sebbene abbia diversi orologi, continuo ad usare questo perché mi piace troppo !. Lo smalto è di OPI...un amico mi ha detto che dovrei smetterla di usare tutti questi smalti scuri...forse ha ragione ma devo confessare che oggi pomeriggio ho comprato uno smalto di Dior di colore nero (si chiama DIVA)...se comprare smalti scuri è un crimine, mi dichiaro senza indugi colpevole, proprio quanto sono colpevole di sognare di vivere a Parigi o a New York !. you always look amazingly stylish! questo outfit ti sta benissimo e sono molto invidiosa di quella maglia!! Adoro il tuo stile e gli smalti neri! 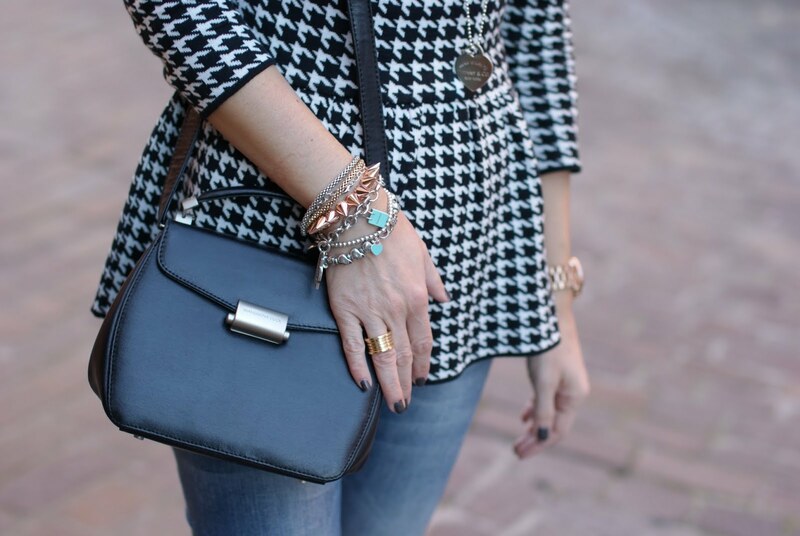 absolutely ADORE the houndstooth peplum with the wedge sneakers!!! I like your sneakers and peplum top very much!! Beautiful outfit, such chic and style! Ma dai quella borsa è di mandarina duck? Proprio carinissima!! E mi piace molto anche il top di pull & Bear! lovely look, so stylish, I really like it. Vale ma non sbagli un colpo, la maglia è così bon ton come piace a me e abbinata alle sneaker sta benissimo!! Mmm .. saranno comode ma non riesco a farmele piacere .. infatti il look mi piace tutto fino alle scarpe .. il top é meraviglioso!